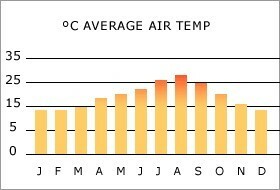 Look at the weather in Ibiza for planning your Holiday in the Villa - Climate information about Ibiza. The weather in Ibiza is a relatively mild climate throughout the year. During the year, Ibiza enjoys an average of 300 days of sunshine with a daily mean of five hours in winter and more than ten hours a day in summer. Humidity is stable, remaining about 70 per cent throughout the year. 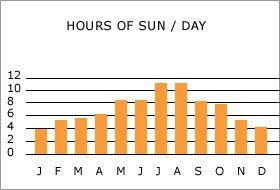 The charts below show maximum and average temperatures and hours of sunshine on Ibiza for each month. The Ibiza summer season and the first really warm beach days begin in May. The Ibiza summer is hot and dry - between the months of June and September, there is very little rain fall. In August and September the temperature rises up to over 30º C, and with water temperatures of 25º - 27º C, beach fans are right in their element. What to Wear throughout an Ibiza summer. May, June and September - In the evenings when out and about you might need a jumper or light jacket, especially if the wind gets up. July and August - The really hot season starts. You ought to be fine with t-shirts, short sleeve shirts and shorts. Lightweight cotton trousers are popular amongst the locals. October - pack a jumper and a jacket - best to be sure, as there are occasional rainy and windy days, when the evening temperature drops down to 17º C! 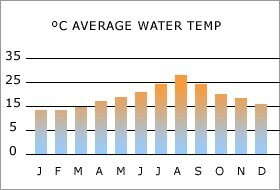 Ibiza has a remarkably mild climate - even in winter the temperature rarely drops under 0º Celsius. Snow is a sensation, and the children save snowballs for weeks by putting them in the fridge! 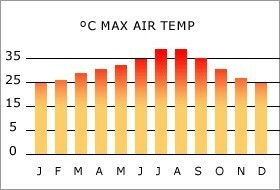 From November to April the average daytime temperature is about 15º celsius - however when the sun comes out this can rapidly climb to 25º C.
It does rain - but a general rule of thumb is that it only rains for 3 days at a time (at least that's what us locals say!). The rest of the time the sun shines down from clear blue skies. Ibiza in Winter is not a beach destination, although on sunny days you will find sun-worshipers on the beach, many of whom still swim! Ibiza in Winter is more a time for lazy beach walks, sport and touring around the island, stocking up on some well-needed Vitamin D (from all the sunshine!). The winter on Ibiza is actually sunnier and warmer than on Mallorca, which of course makes a winter break here such a good idea. If you fancy visiting Ibiza in winter remember to pack some warm clothes, as not all houses and hotels are centrally-heated. But don't worry, all the rooms of the Ibiza villa rental have an electric heating system. In return, the winter guests have the island to themselves - beautiful, deserted beaches with no sun beds or sunshades to spoil the view, and the wonderful feeling of peace and tranquillity for which Ibiza is so well known. windguru for an accurate weather forecast hour by hour, especially handy for boat owners.